Crepes Francaise is no substitute for Paris Crepe! It’s true. While we enjoy all crepes and crepe-related foods, we have a special affinity for Paris Crepe. That said, Crepes Francaise is a couple of blocks closer to us, so it makes sense that we’d give it a try. First of all, though, I need to talk a little about the parents of small children. Toddlers don’t need to eat fancy French food. If I wanted to be around your children, I’d go to Chuck E. Cheese’s. Have tables outside set and ready to go: candles, tablecloths, silverware. The empty, black metal ones they have don’t look like anything. The restaurant always looks closed. Put people in the outside seats even if you have to pay your brother-in-law. People need to see other people outside having fun. Make that happen. Maybe some tall potted plants with twinkle lights in them. No alcoholic drinks outside? Dumb. Again, probably not their fault, but they need to figure out a way to serve alcohol outside. And while we’re discussing the building, we need to also talk about the inside. Not a lot of ambiance here. 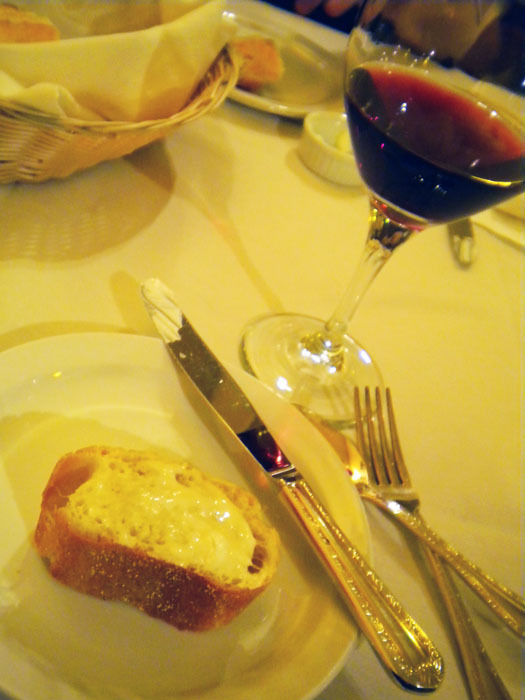 The lights seem too bright, and it feels more diner than cozy French cuisine. Maybe some higher-backed booths would help along with some expertly placed room dividers and plant features. I don’t know. The place seems echo-y and a little harsh. One more problem. We went on a Friday night, and we ordered a cheese-plate appetizer. Oh, sorry, we’re out of cheese. OK. No problem. Drinks? I’ll have this particular beer. Oh, sorry, we’re out of that beer. OK. No problem. How about this one? We might be out of that one, too. Do you have a third choice? And for you ma’am? Oh, I’m sorry, we’re out of that particular wine. Seriously, you can’t be out of anything on a Friday night. Especially things like cheese, beer and wine. Turns out they weren’t out of the second beer. But still. 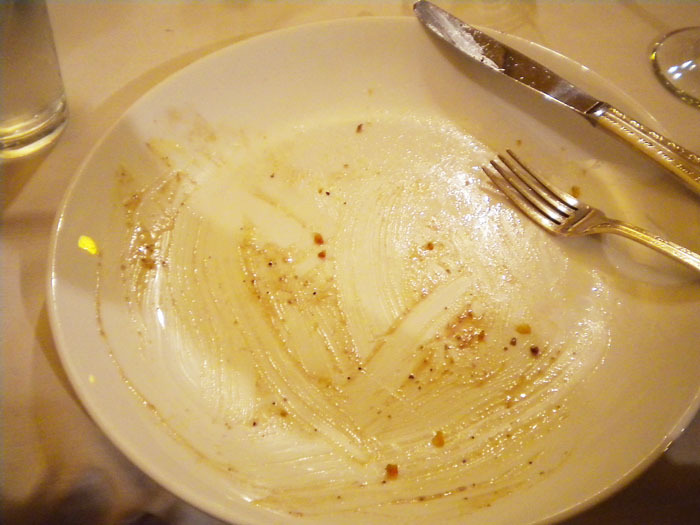 Once we got the food, though, all my complaints faded into the background. Such exquisite deliciousness. I had the salmon, and Adrienne had the steak. Sounds like we’re being harsh, I know, and I am usually a much harder grader, but I really want this place to succeed. And despite its few minor problems, Crepes Francaise shows great promise. They have the fundamentals down: The food is outstanding; the service is great. I hope they make it. 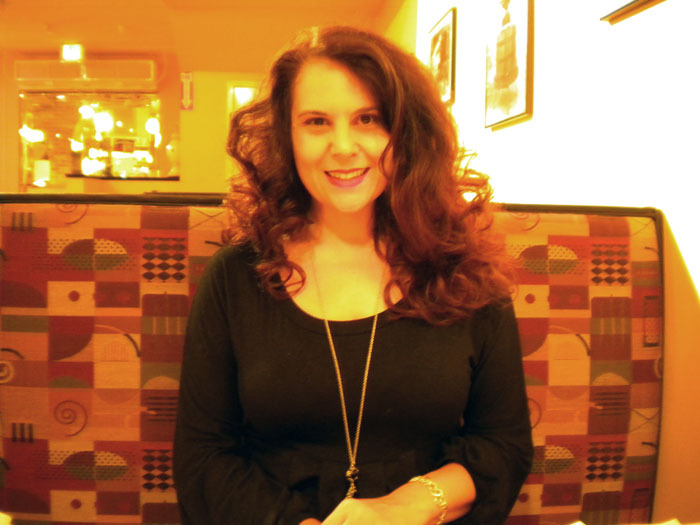 Adrienne made her hair big for our date at Crepes Francaise. I think it looks pretty. Real butter with our bread at Crepes Francaise, downtown Colorado Springs. 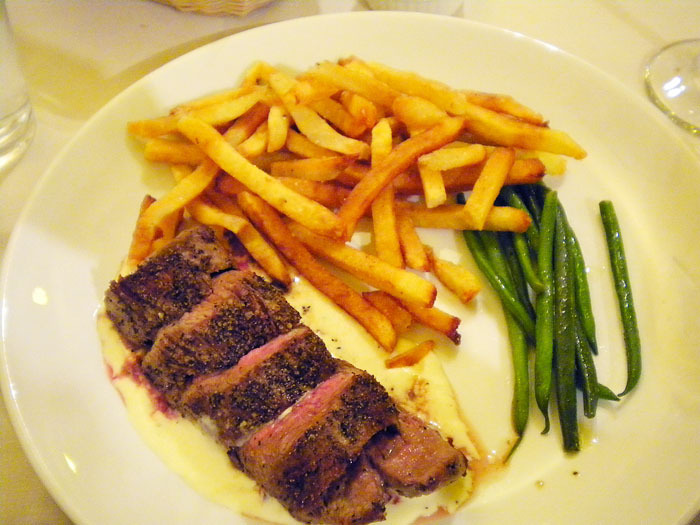 Adrienne's steak, with fries and green beans at Crepes Francaise, downtown Colorado Springs. 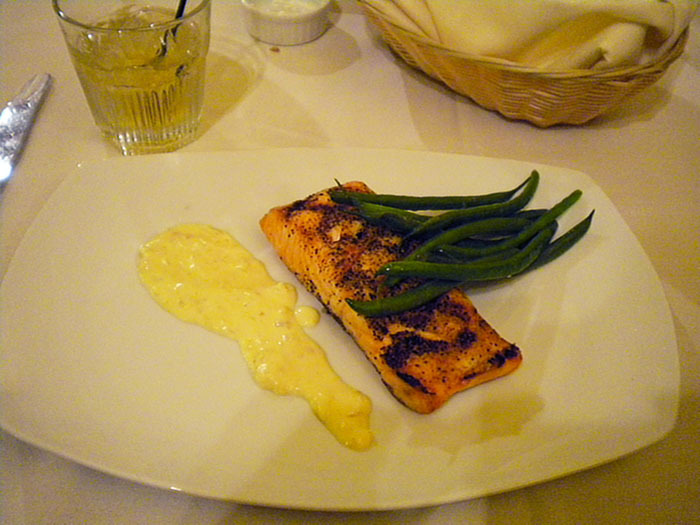 My salmon came with some kind of sauce. As you can tell, I'm not much of a foodie. I also had a Buffalo Trace bourbon. I still see some morsels I could have eaten. Oh, yes. The dessert. Crepes Francaise had the best dessert. 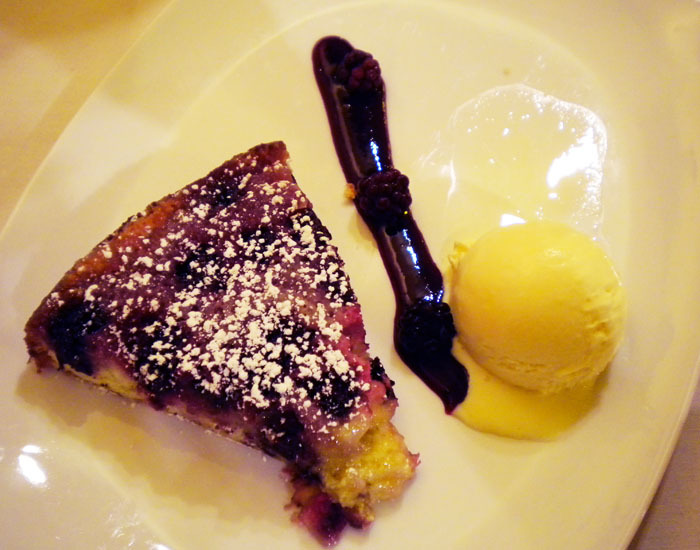 This berry cake with ice cream was pretty outstanding.